Those are just too cute. I have to try it along with my stars and snowflakes. really nice for the holidays. I think I will make this for my niece and add her name. I try to make her some sort of ornament each year and never did get around to it this year. Thanks for sharing. The size appropriate for the yarn you are using. 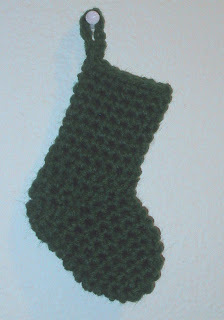 Rows 8 and 9 of the heel portion seem to be missing from the directions - please post them so that I can make this adorable ornament. Round 10 is a continuation of the toe portion, worked in "rounds". The heel is worked in "rows". I would look for a full size sock pattern. This is by far the best pattern out there for stockings. I absolutely love it. I've altered it a little bit to make it my own in a sense, but I absolutely love it! How big do these end up being? 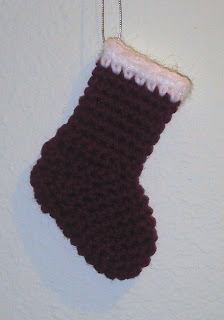 I am looking for approx half the size of a normal size stocking to use for my 8 grandchildren. I might use a full size but want to have a smaller pattern for back up. Busy time of year! Lol Thank you! These aren't that large. I don't have one right now, I gave them all away. Going by memory I'd guess they are about 4 1/2 inches tall.